A study led by Notre Dame astrophysicist Justin Crepp has for the first time definitively determined how many of the lowest-mass stars in the galaxy host gas giant planets. The researchers’ paper, “The Occurrence Rate of Giant Planets around M-dwarfs,” was posted to arXiv this week and submitted for publication in the Astrophysical Journal. The group used ground-based imaging observations in combination with the Doppler radial velocity method to determine that 6.5 percent of low-mass stars, the so-called “M-dwarfs,” have planets located within 20 astronomical units, including the outer regions where researchers previously could not access. “We have invented a new technique that allows us to peer beyond the orbits normally accessible to previous observations, thus taking a much-needed shortcut to the answer,” Crepp said. 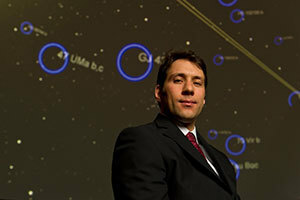 “Our results show that low-mass stars form few planets similar to Jupiter, most likely because compared to Sun-like stars, low-mass stars have less material — circumstellar building blocks, if you will — to start with.” Crepp, principal investigator for the NASA-funded high-contrast imaging program, co-authored the paper with Benjamin Montet, a graduate student at Caltech whom he co-advises, John Asher Johnson, Andrew W. Howard and Geoffrey W. Marcy. Since the first extrasolar planet was discovered in 1995, researchers have identified planets located within 4 astronomical units of stars by carefully monitoring the gravitational “wobble” induced upon the star as the planet orbits. That movement typically creates a measurable periodic signal. In cases where the observations reveal a straight line, or systematic “trend,” researchers suspect they are mapping only a fraction of the signal created by a more distant object with a much longer orbital period. Montet and Crepp obtained images to identify such planets using a sample of 111 M-stars. The results are consistent with the rates found by another technique, called gravitational microlensing, which detects orbiting planets when they pass between Earth and a background star. Such events are rare and not repeated, making follow-up observations challenging. Originally published by Gene Stowe at news.nd.edu on July 26, 2013.